ENGAGE is a high-level conference bringing together specialists in space technology, remote sensing and Earth observation based in the Asia-Pacific region. It is a key annual summit where actors in the geospatial sector come together to compare their experience, keep up to date with the latest technology, and develop partnerships. For the second time, BLUECHAM SAS won the Excellence Award, in recognition of the whole range of its space-related work during 2015. Presented by Kellee Ireland, Executive Director of the Australian Spatial Industries Business Association. 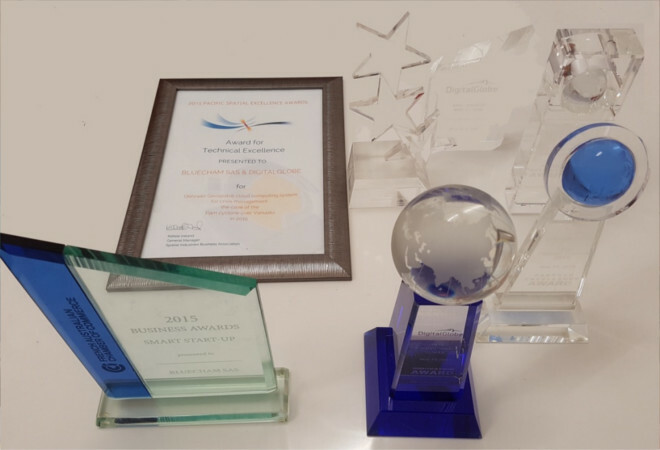 The Technical Excellence Award rewards products and projects that implement space-based solutions of an advanced technical level to overcome major challenges and deliver results that can be appropriated. This category emphasises excellence in applying existing technology and methodologies. The award is based on a number of criteria: the level of complexity of the challenge, the degree of technical excellence in delivering the solution, customer satisfaction and the product’s potential to become a new standard in space sciences. This new Award, made to Rémi Andreoli, Director of Space Applications, recognises the methods implemented in Qëhnelö™ hubs to distribute data gathered from satellite measurements for crisis management and the assessment of natural disaster damage. The Qëhnelö™ solution enables the civil defence services and international associations to gain online access both to GeosatBigData and to precision analysis processes. The space data are acquired in the initial hours of the disaster, and are then renewed daily for one month, enabling the monitoring of the phenomenon’s evolution and impact, and resilience processes. The results were presented to the SPC by Rémi Andreoli (in white in the middle of the photo), and to OCTA (Europe) by Didier Lille. 1st Prize for Innovation, presented by the Deputy Prime Minister of Australia. 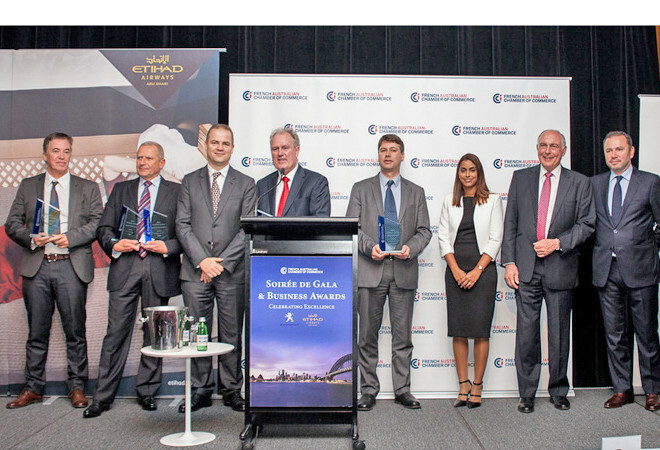 Organised in 2015 by the Franco-Australian Chamber of Commerce and Industry (FACCI), this competition rewards companies for outstanding achievements in their respective fields. 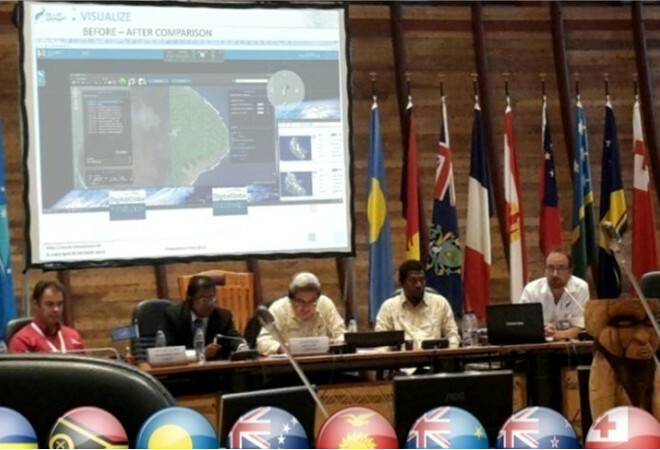 In March 2015, severe tropical cyclone Pam hit the Vanuatu archipelago, with winds of more than 350 km/h. The city of Port Vila, Vanuatu’s capital, was one of the areas most severely affected. The BLUECHAM SAS team deployed a Qëhnelö™ hub, based on the latest very high resolution (VHR) satellites in the WorldView constellation, enabling a rapid assessment of the damage to the city. Didier Lille demonstrated the advantages of using these new data as a daily information flow encompassing the whole city. The competition, organised by New Caledonia’s Chamber of Commerce and Industry, is open to companies based in New Caledonia. 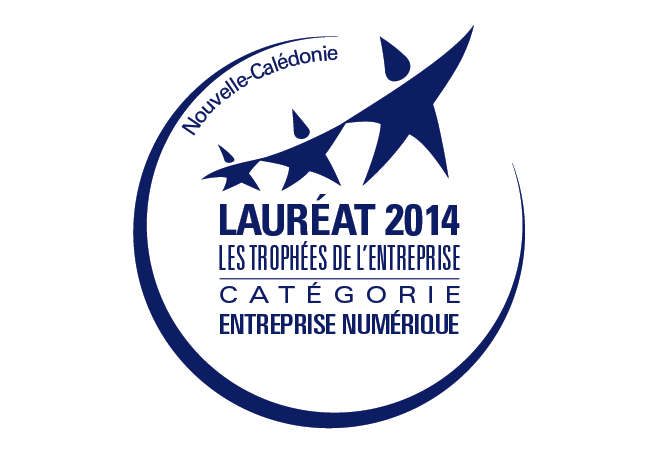 Following the presentation of its dossier by Didier Lille, BLUECHAM SAS won the 2014 Digital Company Prize for its demonstration of the way space data are used in Cloud Computing. The new concept of Geospatial Cloud Computing, incorporated in Qëhnelö™ technology, makes it possible to draw on the potential of satellite data simply by using an Internet browser at any location worldwide. This new economic approach means it is now possible to pay only for space data that are actually used, thanks to this swift and simple process. BLUECHAM SAS won the Excellence Award in recognition of the whole range of its space-related work during 2013. 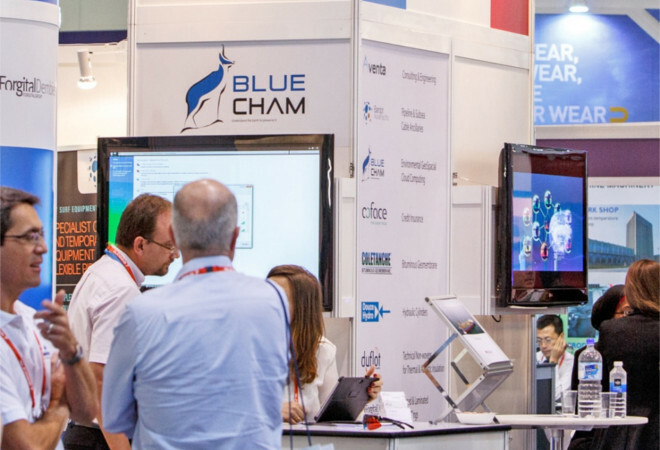 The ENGAGE Innovation Award was also won by BLUECHAM SAS. The award was made for Bluecham’s development of scientific algorithms for the processing of multi-scale satellite signals in order to estimate and monitor lagoon water quality following heavy rain in the catchment areas, and the mechanisms enabling this information to be appropriated by local populations. This competition, which has been running for 18 years, is the French gold standard for spotting potential innovative companies in all fields. Only projects whose technical, economic and legal feasibility has first been established, and that can lead in a short time frame to the creation of an innovative company, are eligible. 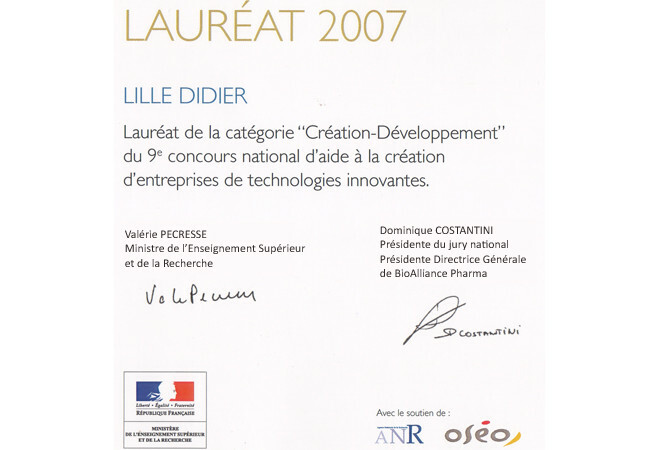 For the presentation of prospective Qëhnelö™ technology, Didier Lille was awarded the 1st National Prize in 2007, along with a €350,000 subsidy, in the face of competition from more than 7000 other dossiers. The Qëhnelö™ dossier described the project in these terms: “Envisioning the interoperability of models and algorithms by applying the same principle as for data interoperability, in order to gain a distributed perception of all the entities and then make them cooperate with each other, is an innovative approach. It should enable better solutions to be found in the future to sustainable development issues, benefiting local populations, and with a view to achieving improved management of natural resources”.